Description: Collection of Tablets of Bahá’u’lláh. 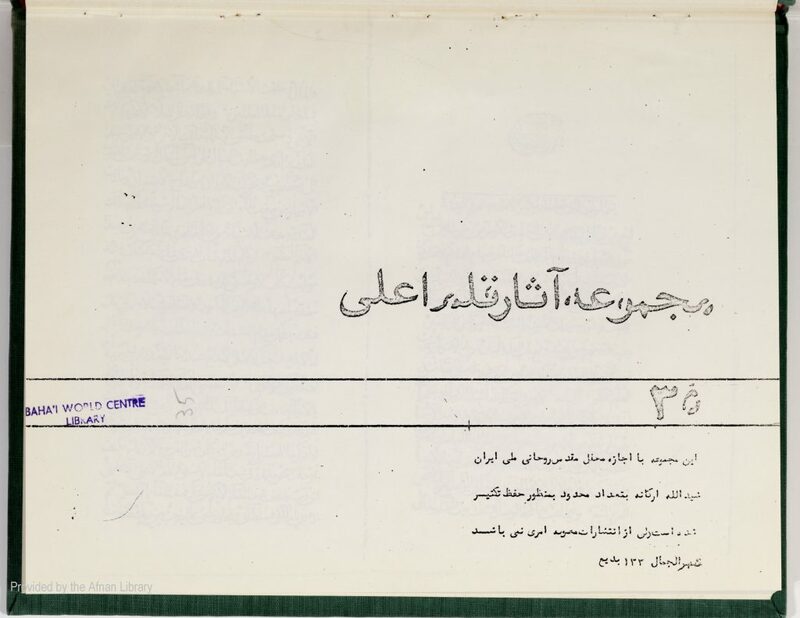 Includes Tablet for the Holy Day of the Birth of the Báb (p. 1), Tablet to a Physician (p. 4), Lawh-i Qiná` (p. 7), Lawh `Áshiq va Ma`shúq (p. 41), Lawh-i Ra’ís (Persian, p. 43), Lawh-i Tawhíd (p. 58), Lawh-i Bahá (p. 70), Lawh-i Manikji Sáhib (p. 116), Lawh-i Burhán (p. 119), Lawh-i Siráj (p. 190), Lawh-i Salmán (p. 276), Seven Valleys . Manuscript, 310 pp. (158 pp. of PDF).